Does anyone listen to baseball anymore? Yeah, I meant to emphasize the word. And when I say listen, I mean on a radio -- not through some fancy-shmancy streaming Internet connection. Hey, do they even make transistor radios anymore? That question, I suppose, should be asked first. I'm not a radio listener, per se. I must confess that. If I'm not in the car, then the radio isn't on. And since I work from home mainly, my time spent in the car has even dwindled. So I'm one of the guilty parties here. Some of my fondest memories from being a kid was of my dad, listening to the Tigers as he knocked off his "honey-do" list. It was a weekend afternoon, and the comforting sounds of Ernie Harwell and Paul Carey were soothingly in the background as the lawn was mowed or the shrubs trimmed. It all emanated from a transistor radio of some sort, likely precariously perched on a picnic table or a window ledge. But it wasn't just my dad at home. I seem to recall the Tigers being on radios all over the place: in the car next to ours at a traffic light; at the local soft serve ice cream joints; at the gas station. Everywhere, Ernie and Paul's voices would be murmuring in the background. It didn't matter that you couldn't make out exactly what was happening. What was important, was that the game was at least on, for someone's consumption. Folks would take their transistors to the beach, or the park, or anywhere, really. And they were taken for one reason, and one reason only: to keep up with their Tigers. They certainly weren't packing them along for the news or the weather, or some such nonsense. It's hard enough to get today's younger fans to watch the Tigers, let alone listen to them. The TV pie has been cut into so many slices, they're as thin as Catholic hosts at Communion. Too many options. Then there's that damn Internet -- with their "game casts" that involve sitting in front of a monitor and watching, in silence, the play-by-play occur, in words and symbols. The Net truly is amazing; it has somehow come up with a way to keep track of the game without watching or listening to it. I know it's odd to think about baseball on the radio the week of Thanksgiving, but I'll pretty much take anything to draw attention away from the Lions, you know? When was the last time you listened to the Tigers, when you weren't in your car? I tried it a couple summers ago -- plugging my boom box into the outlet outside the house and blasting the game as I trimmed things in the backyard. It was OK -- not as good as Ernie and Paul, but not bad. Maybe if I'd do it more, Dan Dickerson would grow on me. His partner, Jim Price, grows too -- but like mold. He's another story. Without much else to think about when it comes to the Tigers, heading toward Thanksgiving, I actually came up with something. Does Brandon Inge help or hurt the cause? It's a simple question to pose, but not as easy to answer. Does Brandon Inge, with his premium leather at third base, save more runs than he fails to produce in the batter's box? It's a relevant question, and has been for several years now, even as Inge has been rotating positions like tires on a car. It seems as though Inge is back at third base, his favorite position. It would take too long to explain how he got there, but here's the short version: Carlos Guillen appears to be the Tigers' left fielder, and Dusty Ryan or a player TBD will be the everyday catcher. That leaves 3B for Inge. But here's the rub: third base is typically a position where you get some offense. Stellar glove work is great, but you gotta see some numbers with the bat, too. Inge has become, frankly, a good field, no hit kind of player. 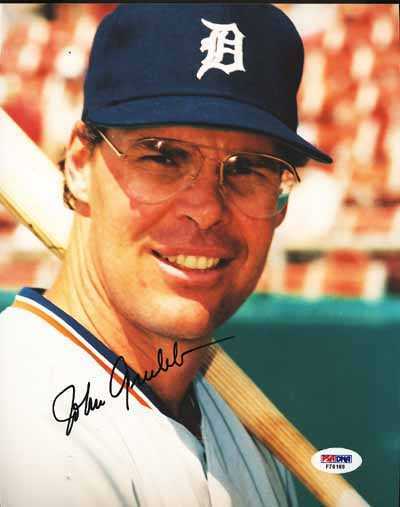 The Eddie Brinkman of today's Tigers. But Steady Eddie played shortstop in an era when you didn't require offense from that position. The game was full of Mark Belangers and Dal Maxvills and Brinkmans, until the latter portion of the 1970s and early-1980s, when players like Robin Yount, Cal Ripken Jr., and Alan Trammell began contributing offensively. Then it became chic to have a SS who could hit, too. Inge isn't getting any better, really, with the bat. His batting averages are consistently low, and what pop he has is more than neutralized by his enormous propensity to strike out. He's a true no. 9 hitter. Which is fine -- someone has to hit ninth -- but is it fine for your everyday third baseman? The easy answer is to say that Inge is so good defensively, robs so many others of base hits, that you can afford to have him drag down the bottom of your batting order. The other easy answer is to pose another question: What to do with Brandon Inge, then, if he's not to play third base everyday? Good question. So I guess you're stuck with him. 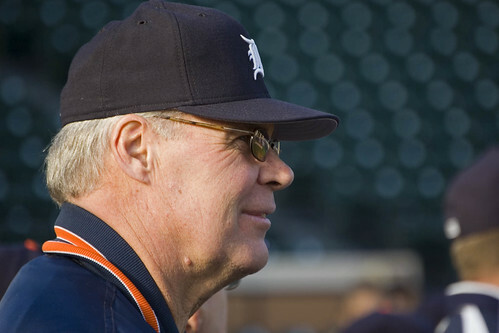 Now, I know that the Tigers have no choice but to play Inge at third base. And I know that he certainly robs others of base hits. He really is that good with the glove. But I bring it up because if Inge is to continue to do this, play 3B for the Tigers, then he must improve with the stick. His career depends on it. Because sooner or later, the Tigers or other teams are going to err on the side of offense and determine that they can downgrade slightly defensively in favor of a more potent bat at 3B. Inge, believe it or not, is going to be 32 next May. His career BA is below .240. He strikes out about once for every four at-bats. It's tempting to say that this is as good as it gets for him. How many players suddenly start to hit at age 32? But it's possible to show improvement. The easiest thing to do would be cut down on strikeouts. That can be done with mechanics, like shortening the swing, choking up slightly, etc. Just putting the ball into play more frequently would be improvement for Inge. He's not a home run hitter, per se, so it's not like you'd be robbing him of that by working with him on reducing the Ks. Look at me, talking like a hitting coach! But in all seriousness, Brandon Inge needs to start picking it up offensively. He's been able to forge a MLB career without much of a bat thus far, but that train may come to a screeching halt one day -- in Detroit or elsewhere. Three years ago, he made news by signing veteran free agent pitcher Kenny Rogers, fresh off a summer in which Rogers took a few jabs -- literally -- at a cameraman and in which Rogers took an All-Star spot for the game at Comerica Park that Detroiters felt (me included) belonged to Jeremy Bonderman. Two years ago, he made news by trading for enigmatic outfielder/DH Gary Sheffield. Last year around this time, he set the baseball world on its ear by trading for Miguel Cabrera and Dontrelle Willis -- just a month after dealing for SS Edgar Renteria. Tigers GM Dave Dombrowski sits on a considerably warmer seat this November and December than he did at any other time in his tenure in Detroit, which began seven Novembers ago. Never before, in Motown, has his job security been in question. There truly is a first time for everything. DD is vulnerable because of the verifiably awful 12 months he has just experienced -- some of his own doing. After the 2007 season, a summer in which the Tigers had the best record in baseball at the All-Star break then faded afterward, DD got out his scalpel. Then he said, "screw this", and got out a meat cleaver. In came LF Jacque Jones (remember him? ), SS Renteria, and 3B/1B Cabrera and LHP Willis. Gone were a lot of the Tigers' future players, in the trades. On paper, the moves seemed to be exactly what the team needed to separate itself from the pack in the AL Central. Some said it separated them from the rest of MLB. Oh, they separated the Tigers, alright. But in the opposite direction. Incredibly, the Tigers sank to last place in their division, behind even those perennial doormats, the Kansas City Royals. Was that bad season enough, by itself, to put DD on warning? Well, Tigers owner Mike Ilitch didn't pay $138 million kajillion to finish behind the Royals. Let's just put it that way. Nothing DD touched last year turned into anything remotely like gold. 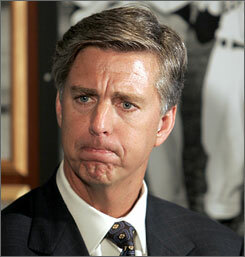 If there was ever an award given out called The SO NOT Executive of the Year, Dombrowski would have won, hands down. He had all the success that that bull in the china shop had in not breaking anything. So yes, these awful last 12 months are enough to make DD a potential ziggy victim, if significant improvement isn't shown in 2009. He and his manager, Jim Leyland, are both on the radar now. Neither has much margin for error. A 75-87 record, after what the owner provided in terms of both financial and emotional support, is unacceptable. First there should be apologies. Then there should be some more careful, more precise moves to address the Tigers' suddenly vacuous franchise. And these moves had better work. Too much pressure? Tough. Dombrowski took a turn at the roulette wheel and the slot machines last year, and came up with nothing but 00s and lemons. With the owner's money, to boot. The Tigers are, strangely, much worse off now than they were one year ago before all the splashy, high-profile signings and trades. That's usually not how it's supposed to work. Let's see what DD does this off-season to patch these holes: pitching, defense, shortstop, catcher, left field. That's a longer shopping list than you normally have if you are a contender. But it's about the right length when you're a last place team, which the Tigers are, like it or not. Dave Dombrowski has done a lot of good things since taking over in November 2001. You could even argue that he's done more good than bad, overall. But coaches with overall winning records get fired, if those wins didn't come at the right time. It's a "What have you done for me lately?" business, sports is, and if you look at DD's record lately, it's not pretty. Is it ugly enough to get the ziggy? Not by itself, but another series of blunders is likely to put DD over the top -- and off the cliff. "Superjew" Epstein Could Never Be Nicknamed That Nowadays, Could He? I doubt that Rocky Bridges could have gotten away with it today. Too many PC types -- and I don't mean personal computer. But in the mid-1960s, Bridges, managing in the California League, marveled at a rival first baseman who was on his way to winning the league MVP Award for leading the circuit in batting average and home runs. And since that first baseman had a plainly ethnic last name, Bridges came up with what he believed to be an apt nickname: Superjew. "Superjew" was Mike Epstein, who won the California League MVP Award in 1965. The next year, Epstein was in the big leagues for the start of a nine-year career as a power-hitting first baseman, achieving moderate success. He did hit 20+ homers three times, including 30 in just 403 at-bats in 1969 for Ted Williams's Washington Senators. All told, he swatted 130 four-baggers. Epstein possesses one of my all-time favorite nicknames, and I hope that revelation doesn't put me in bad stead with the PC types. But Superjew is also one of my favs because I think it's a type of nickname that is probably extinct: the ethnic nickname. They're innocent, really, but I doubt anyone could get away with such handles in today's mainstream. I won't bother giving you examples, because that'll REALLY get the PC people on my case. At the turn of the 20th century, nicknames were even crueler, but they were totally accepted. You've probably heard or read of ballplayers with first names of Dummy or Rube. "Dummy" was either someone who didn't talk much, or, worse, someone who was literally a deaf mute -- which happened more often than you think. "Rube" was usually someone who wasn't, ahem, a Rhodes Scholar, if you know what I mean. That would be like using a derogatory, slang name today for a mentally challenged individual, that also starts with "r". I think you know what I mean, and can you imagine such a thing? Returning to Epstein, even though there's nothing slang about "Jew" (just short for Jewish), it just seems to me that we've become SO sensitive to anything remotely ethnic that even using accurate, accepted words describing someone's heritage can be off-putting when done in nickname form. I'm half-Finnish. If someone were to call me "SuperFinn", I wouldn't care at all. Of course, I first need to DO something to be called SuperFinn, but that's another story. But Superjew just seems to be pushing the envelope a bit. Maybe I'm off-base, and ignorant, or both. Who doles out the nickname also has great impact on whether that nickname is socially accepted. If Epstein's fellow Jews were to coin it today, then that's far more acceptable than if some crusty old, non-Jewish manager were to do it. Someone like Rocky Bridges, for example! Epstein is still around, a New York kid from the Bronx who's now 65. So is Bridges, 81. By the way, Bridges's real name is Everett Lamar Bridges. No wonder he opted for Rocky. Well, here we are. Just as I feared. One of the rights of ink-stained wretches and bottom-feeding bloggers is to occasionally play GM, usually when the team needs us the most. So since I belong to both fraternities, and since it's my duty to say, in so many words, "told ya so! ", I just have three words today about the Tigers' catching situation. If the Tigers were to take the field tomorrow for Opening Day, Dusty Ryan would be behind the plate. Let's just hope that this isn't the case when the team opens for real next spring. This isn't to knock Ryan -- well, maybe a tad -- because he's probably a nice kid whose fault this certainly isn't. But I began wringing my hands as long ago as 2006, worried that the Tigers had no heir apparent, apparently, for Pudge Rodriguez at the catching position. Then 2007 came and went. Nowhere could a bona fide major league prospect at catcher be found within the Tigers organization. The only thing that became apparent, instead of an heir, was that the Tigers appeared to think that Rodriguez would catch for them forever. Like he was some sort of baseball Methuselah. Even a healthy Vance Wilson wouldn't have been the answer, for Wilson is a great backup, but nothing more. Then the Tigers had a solution in spring training, 2008: Brandon Inge would be the heir apparent at catcher -- for the second time in his career. This was made necessary, of course, by the trade that brought 3B Miguel Cabrera to Detroit. Inge grumbled and groused about it, as has been his wont. But at least the Tigers had a catcher-in-waiting. But Cabrera proved ill-suited at 3B, and was shifted to first base. Carlos Guillen was made the new third baseman. Inge became the full-time catcher after Rodriguez was traded to the Yankees in July. Now the Tigers want to move Guillen to left field. They're running out of positions for Carlos. It's almost like they're trying to hide him and his glove in plain sight. He's becoming the Tigers' white elephant in the room. Guillen's third shift in positions means Inge is now the third baseman -- again. Hell, he's been catcher twice, so why not make him the third baseman for a second time? Which brings us back to catcher. Still. Ryan, with all due respect, is not ready to be a starting big league catcher. He's the Sarah Palin of the Tigers. Let him be the backup, at best. Just as I feared and warned (why don't they ever listen to me? ), the Tigers are without a big league catcher for 2009. The position isn't one to be trivialized. The Tigers have a new pitching coach, Rick Knapp. The staff was a mess last year. The last thing they need is a catcher with peach fuzz. Since a Pudge II scenario is unlikely, I'd be happy with Varitek. Or Gerald Laird, if the Tigers can pry him from Texas. Laird is outstanding defensively. Sorry, but all this could have been avoided. Seven years and no catching prospects? Dombrowski and his crack staff whiffed on this one. Comerica Park About To Head Into 10th Year, So Where Are All The Memories? I'm not sure what memories the Tigers fans had of Navin Field in 1921, upon the ballpark's tenth season as a major league stadium. Doubtless they would have included the exploits of Ty Cobb, Sam Crawford, Harry Heilmann and the like. Right there, that's a treasure trove. Not bad for the first ten years of any ballpark. Don't look now, but next season will be the tenth for the Tigers in Comerica Park. It's true. Year No. 1 was in 2000, with its christening coming on a snowy April 11. So what do we have to show for it? What special memories have we gathered? Answer: nothing much before 2006. And nothing much in 2008. So it was just the seasons of 2006 and 2007 that have provided anything that you'd care to remember. I suppose Opening Day, 2000 should be thrown in there, though. Any ballpark's first game is something that should be marked indelibly in the brain. The fact that the Tigers beat the Seattle Mariners in a mini-snowstorm makes it even more memorable. It reminded me of the Toronto Blue Jays, who beat the Chicago White Sox and the snow in their first-ever game in 1977. Whoever decided that Toronto would be a dandy place for a season-opening game ought to have his head examined. Or has never been to Toronto, or anywhere north of the Mason-Dixon Line in early April. The Tigers didn't win too many ballgames in CoPa's early existence, which contributes to the lack of decent memories. Remember, until '06, the Tigers posted losing records in every season after 1993. A shiny new stadium did nothing to change that. For a brand new stadium, CoPa was shockingly devoid of early, memorable moments. After Opening Day, there wasn't much else to recall about 2000. We talked a lot about the cruel dimensions of left center, but that was about it. Juan Gonzalez sulked his way through his only season as a Tiger. I remember that, too. But no signature moments, per se. There were a couple of walk-off wins in the final days of the 2003 season, when the Tigers managed to avoid losing more than the 120 games dropped by the 1962 Mets. So that's something, I guess. Even the visitors didn't do much of note in the years from 2000-05, other than just beat the pants off the home team. No amazing, individual performances, like when Boston's Freddie Lynn struck for three home runs, a triple, and 10 RBI in a game at Tiger Stadium in 1975. Of course, with CoPa's initial dimensions, a visiting player would have needed an entire season, at least, to manage three homers in Detroit. 2006, of course, made up for the park's first six seasons. 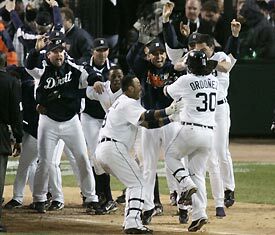 The pennant-winning Tigers piled memory on top of memory, culminating with Magglio Ordonez's walk-off homer to vault the Tigers into the World Series. 2007 saw Justin Verlander's no-hitter -- the first by a Tigers pitcher in Detroit since 1952 -- and Ordonez's drive to the AL batting title. 2008? I think we just as soon forget. Maybe down the line, some 20-30 years from now, we'll be able to compile an impressive array of memorable moments that occurred in Comerica Park. But we have a paltry list as we head into Year No. 10. Let's hope it picks up.